The Church is not a business, but it does have a stewardship responsibility to ensure that all of its resources are used as effectively as possible to carry out God's work on earth. In the case of human resource assets, good stewardship involves assisting those engaged in ministry (whether clerical or lay) to achieve their greatest potential through the various components of performance management, including performance assessment. This unique collection brings together both scholars and practitioners who tackle the tricky questions related to the performance management of lay Church workers and clergy (priests and deacons). Performance management is multi-faceted, ranging from issues about hiring, job descriptions, performance criteria, performance appraisal, formation, and firing procedures. As a charitable organization, the Church is subject to the same civil law employment regulations as companies in the private sector. 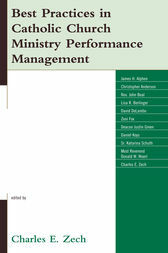 Contributors demonstrate that Canon Law and Church tradition supports the performance management of Church ministers (including clergy). This is a valuable resource for programs in church ministry, pastoral administration, and in the emerging field of church management. I know no one who is more committed than Charles Zech to taking 'best practices' from business and translating them into the management practices of Catholic organizations. His commitment and competence are reflected in the quality of the contributors he has assembled to produce this valuable book. Charles E. Zech is the director of the Center for the Study of Church Management and professor of economics at Villanova University.